The Barn Swallow is a distinctive bird with bold plumage and a long, slender, deeply forked tail. Barn Swallows are deep blue above, with an orange-buff breast and belly. They have russet throats and forehead patches. The rest of the head is deep blue, extending in a line through the eye, giving the birds a masked appearance. Females are slightly duller and shorter-tailed than males. Juveniles look similar to adults, but have much shorter tails. Barn Swallows can often be seen foraging for insects low over fields or water. In bad weather, they sometimes forage on the ground. They gather mud for their nests from mud puddles, although they do not raise their wings when they do this. Hirundo rustica is a widespread summer visitor to most of Europe, which accounts for less than a quarter of its global breeding range. Its European breeding population is extremely large (>16,000,000 pairs), but underwent a moderate decline between 1970-1990. Although declines abated or even reversed in certain countries during 1990-2000, the species continued to decline across much of Europe, and underwent a small decline overall. Its population has clearly not yet recovered to the level that preceded its initial decline. The Barn Swallow's close association with humans in Europe goes back over 2,000 years. In North America, the shift from natural to human-made nest sites was nearly complete by the middle of the 20th Century. 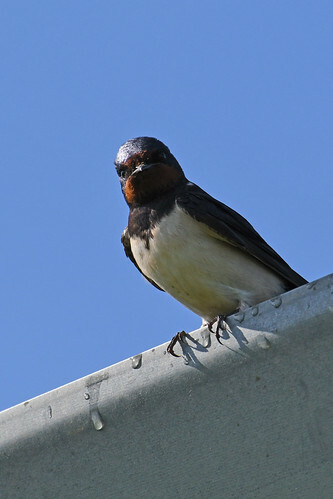 The Barn Swallow's range has expanded considerably in North America with European settlement, and Barn Swallows are widespread and abundant across their current range.